Karo Halabyan is a famous Soviet architect and academician, the member of the CPSU (RSDLP) since 1917. He has graduated from the Moscow Higher Artistic-Technical Institute in 1929. It was there, during the years of study, he met and became good friends with the architects M. D. Mazmanian, G. B. Kochar, V. N. Simbirtsev, in cooperation with who he subsequently built many buildings in Moscow and Yerevan. After graduation, Halabyan returned to Yerevan, where rapid construction had just started. Halabyan had spent only two years in Armenia, but in this short time he managed to do a lot. Builders’ club, residential building of electrochemical Trust, the house of chief of geological and exploration management, and many other places were built in Yerevan based on his projects (he headed the Gosproekt). And this practical work Halabyan combined with instruction in the architectural department of the Yerevan Polytechnic Institute. Since 1932, he lived and worked in Moscow. 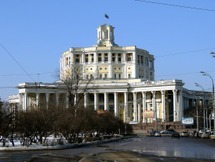 From 1932 to 1950 Halabyan was secretary of the Union of Architects of the USSR. From 1937 to 1950 Halabyan was the deputy of the Supreme Soviet of the USSR. He was the Vice President, President of the USSR Academy of Architecture. In 1943-1945 Karo Halabyan led the development of the recovery plan of Stalingrad. The buildings of the Sochi Sea Port (jointly with L. B. Karlik), the Central Academic Theatre of Russian Army (together with V. N. Simbirtsev), ground subway station Krasnopresnenskaya (jointly with T. A . Ilyin, V. I. Aleshin, and T. D. Zebrikova) have been constructed based on the project of Halabyan.